It’s easy to have a soft spot for Leitrim, that gentle-paced Irish country whose traditional music seems to match the rises and rolls of the landscape and the tone of the flute players is as clear as the glassy waters of Lough Allen. 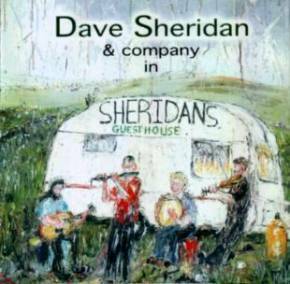 Dave Sheridan is one such instrumentalist and comes from the tiny village of Killargue, halfway between Manorhamilton and Drumkeeran, but he’s not just a dab hand on the flute, but the button accordion and low whistle too, as Sheridan’s Guesthouse amply illustrates. For any recording debutant it’s always a boon to be surrounded by inspirational companions, so Dave has corralled the doyen of local accompanists, Sligo’s Séamie O’Dowd, into the studio as well as the ex-Dervish man’s string-plucker in arms, mandola-player Brian McDonagh, and a host of other musicians from his musical stomping ground. While Dave’s flute takes on lark-like qualities, not least on the effervescent opener Mulhaire’s/Kiss the Maid Séamie proves a bedrock throughout this utterly enjoyable album. However, the sparks truly fly when Dave hooks up with with long-time London-based fiddler Brian Rooney for Maid on the Green/Humours of Drinagh, while the thoroughly foot-stomping set of reels kicked off by Johnny Allen’s sees his accordeon trading notes in remarkable rapidity with the uilleann pipes of Patrick McGovern. Elsewhere, there’s a flute duet to die for, Enya’s Fancy, featuring Dave’s cousin Seán Gilrane, and two tracks revealing the talents of fiddler Pádraig O’Neill from Dublin (clearly revealing himself as one of Ireland’s greatest wasted talents – as for why, the story’s too long to tell). So book yourself a room in Sheridan’s Guesthouse, the rooms might need refurbishing, but the house band is a killer. This review by Geoff Wallis originally appeared in fRoots magazine (www.frootsmag.com). For more information contact Dave at sheridansguesthouse ‘@’ hotmail.com [removing the gaps and the quotes – apologies for this spam avoidance measure].